The short brewing cycle of North-East India Pale Ales (NEIPAs) is aided more by kegging the final product to go from brew day to glass. Here I sit only 15 days after brewing Swim? Swammi? Slippy? Slappy? Swenson? Swanson? NEIPA and I am reviewing the tasty elixir. I have to really enjoy this keg as it will be the last that I have in at least six months of my home brew. I am undergoing surgery that will not allow me to lift for some time. 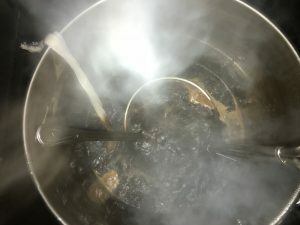 I am worried about all the stress reliever brew days that will pass without a brew day. Hopefully I will be back at it before the end of 2018. Look: Pours golden yellow. Very hazy, even cloudy.. Nice white foam covers, about an inch thick. Retention is above average. Lacing is nice. Aroma: Yes, the hops abound. Passion fruit, mango and pineapple are foremost. Light sweetness. Great hops on the nose! Taste: More sweetness than I expected. Mango and pineapple carry throughout. Sweetness stays in the side of the cheeks and front of the tongue. Body: Medium body. 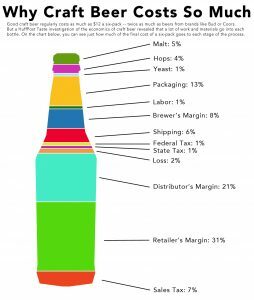 Medium carbonation. Dry. Minimal bitterness is giving it too much credit: it almost doens’t exist. Overall: Citra and Mosaic definitely help a beer out. The citra does add a lot of sweetness to the beer. I assume there is a place in which it would be overwhelming. 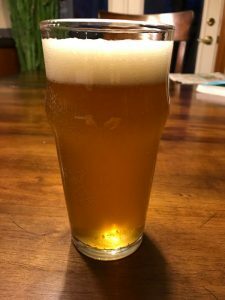 This beer is my last home brew for quite some time and it did not disappoint my senses. Six months should more than enough to come up with some more great hop combinations. Long live Mosaic and Citra in hoppy beers. Enjoy! Useless Fact: Forest fires move faster uphill than downhill. 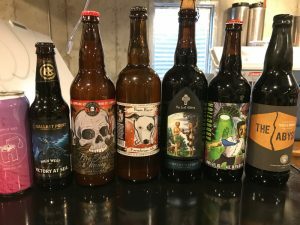 Home brewing has the fun of experimentation. Recently I have been using old school hops and force combinations. They have been good but definitely not great, especially when brewing a north east india pale ale (NEIPA). 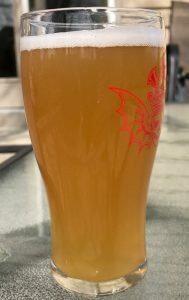 Citra and Mosaic seem to be in used in many professional versions of NEIPAs, either solo or in conjunction with one another. The hops lend that layer of tropical fruits that make the juicy style juicy. Swim? Swammi? Slippy? Slappy? Swenson? Swanson? started out with Amarillo, Simcoe and Citra. Mainly to get rid of the Amarillo and Simcoe while the Citra was there to add mango, pineapple and papaya. The mosaic was added in after some thought to try and produce a great representation of the NEIPA style. The malt profile is similar to other NEIPAs that I made: base malt, oats and wheat. Nothing fancy but seems to fit the profile well. It may end being my base profile going forward, allowing me to play with and understand hop profiles better for the style. As I have been doing, I used 50% reverse osmosis water with no treatment to the other 50% from the tap. Next time I am going to do a 75%/25% split of reverse osmosis to tap to see if this allows the hops to shine even more. Enjoy! 2018-03-10 (morning): @60.2*F, slow fermentation. Put on heat at 68.0*F.
2018-03-10 (evening): @66.3*F, medium/high fermentation. Took off heat. 2018-03-11 (morning): @65.6*F, great fermentation/aroma. 2018-03-11 (evening): @67.3*F, great fermentation/aroma. 2018-03-13: @68.0*F, added dry hops. Put on heat at 70.0*F.
2018-03-15: put in freezer at 39*F.
Useless Fact: The famous painter Pablo Picasso burned many of his paintings to stay warm when having financial troubles. Loblolly coffee oatmeal stout came about as I am constantly bombarded by the great aromas of specialty coffees at work. I am not a coffee drinker though, I am an appreciative stalker of the fantastic aromas that I waft each and every day. It made me think back to my coffee experiment a couple of years ago. I found in that experiment that I appreciated the 1.0 ounce per gallon of coffee version the best. I knew that I had to add approximately this amount of coffee to the beer post fermentation. Rack the beer on top of coffee juice into secondary. Using a funnel, pour the coffee juice directly into primary, post fermentation. The first option requires an extra step, racking to secondary, that I didn’t want to do. Lazy. I have grown accustom to making NEIPAs, dry hopping directly in primary, therefore secondary is no longer an option I prefer. 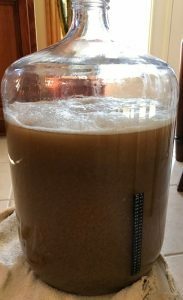 Still, I know that pouring the coffee juice into primary, post fermentation, could and would introduce oxygen into the beer. I had the coffee ground “normal”. Not fine and not coarse. Place a coffee filter (large) into a bowl that was plenty big. Put the coffee inside the filter. Fill the bowl with enough vodka to cover the coffee grounds. Note: take into account that the filter will soak up liquid until is is saturated. Place a plastic bag on top of the cold steeped coffee juice. Steep for a few days. This is the basic process that I use for most steeping. The vodka doesn’t add flavor or aroma but kills any microbes that may be hiding in the ingredients that are used to make the juice additive. I hope this beer comes out well. Enjoy! 2018-01-28 (morning): @60.9*F, faint fermentation. 2018-01-28 (afternoon): @60.6*F, faint fermentation. Put on heat at 68.0*F.
2018-01-29 (morning): @67.9*F, great fermentation. 2018-01-29 (evening): @67.1*F, nary fermentation. Set heat at @70.0*F.
2018-01-30 (evening): @70.1*F, fermentation finished. 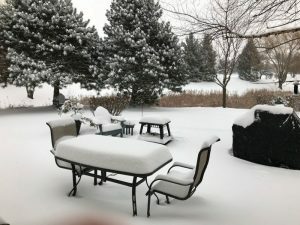 2018-02-07: @58.1*F, added juice from vodka and 4 ounces of coffee. Useless Fact: Standing anywhere in the state of Michigan a person is within 85 miles of one of the Great Lakes. Being new to kegging my home brewing endeavors, each and every process I partake is new. Since I am a logical person, processes are always met with a why and how may I do it easier and cheaper. Sometimes, I even wonder if the step is necessary. How often does this need to be done? What is the process for cleaning? Is there only one way to clean? What supplies/equipment is/are needed to clean the lines. Doing a search for tap lines cleaning quickly brought up the purchase our product and do it this way solution. In fact, the SEO for that process must be awesome as it was listed multiple times in the search engine results. I didn’t like the price tag. There had to be home made examples that would cost half as much or less. Of course, finding them wasn’t hard. There were videos of the build and cleaning process. I liked the $20 for the solution. I decided to write about it to help get the word out, highlight the videos I used and give an actual part list. Flo Master 56HD (~$6.99) – pick this up at home depot. It is in the lawn and garden section. 3/8″ brass flare tip connector (~$1.69) – pick this up at home depot as well. Firestone keg liquid post (~$14.99). 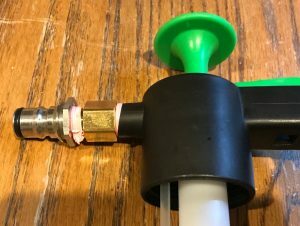 There is a link in the first video to buy one on line but bring the brass flare time connector with you to the local home brew shop and you will have it immediately. Teflon tap. Come on, any DYI will have this laying around. I had to use a wrench to fully get the flare tip connector into the Flo Master. Be careful as to not over tighten. The picture is a close up of how the pieces go together on the Flo Master. Somewhat hard to see in the videos. Watch the videos on how to put it together: much easier than trying to explain. The two videos, that together combine to give the parts list, as well as how to assemble and use the beer line cleaner, are both included below. Useless Fact: A giraffe can run faster then a horse, and can live without water longer than a camel. It is snowing outside, the temperatures are in the teens, no better time than the present for a home brew. with the Afro Six-Nine seems to be the prefect beer for the present moment. Of course this fits the bill of a North East India Pale Ale (NEIPA). Look: Pours golden yellow. Somewhat hazy, could possibly call it cloudy. Nice white foam covers, about an inch thick. Retention is above average. Lacing is thick, coating and throughout. Aroma: The nose is big on the hops. Passion fruit, peach and some berry mingles. Ripe! Gentle sweetness. The aroma is huge! Taste: Light sweetness balances a huge hop flavor. Ripe passion fruit and peach are prevalent. The hops linger into finish along with a sidecar of sweetness. Body: Medium body. Medium carbonation. Crisp and dry. Bitterness is minimal. Overall: There is huge aroma on this beer. Definitely the star. Taste is solid. Overall a good example of the style. The hops work well together. My first kegged NEIPA. Being able to get a small snort is so much more enjoyable than having to finish a 22 ounce bomber all the time. Enjoy! Useless Fact: Most lipstick contains fish scales. Leaner saison has been a go home brew of mine for quite some time. Unfortunately I only blogged about in 2016, when I made a version of leaner saison with mosiac hops. Blogging on version d of leaner saison is more of an exercise than it is to log the beer. Four iterations of the beer with minimal changes (yeast and hop), leave little to document. 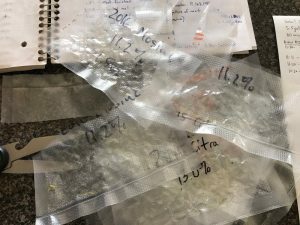 The reason I decided to brew leaner saison: I had another satchel of Lallemand Belle Saison yeast that needed using before expiration. It had been sitting for at least four months, from the late summer, with thoughts that it would have been used rather quickly. rye, as I enjoy the profile in a beer. left over Azacca hops needed to be used. been wanting a home brewed saison since the summer. Let’s hope the first beer of 2018 will be fantastic. Enjoy! 2018-01-06 @6:00pm: @65.6*F, little fermentation. Added heat at 68.0*F.
2018-01-07 @7:30am: @66.5*F. Moved heat up to 71.0*F.
2018-01-07 @1:00pm: @70.2*F. Moved heat up to 73.0*F.
2018-01-07 @6:00pm: @71.9*F. Moved heat up to 75.0*F.
2018-01-08 @6:30am: @73.4*F. Moved heat up to 78.0*F.
2018-01-08 @7:30pm: @77.8*F. Great fermentation. 2018-01-10 @7:15pm: turned off heat. Useless Fact: In the movie “Ocean’s 11,” Brad Pitt’s character is eating something at the beginning of each scene.